You are currently browsing the Breaching The Web blog archives for August, 2009. I’ve had a very foody (not foodie) weekend. First, I went to the farmer’s market, where I bought some beautiful fingerling potatoes and a ton of summer squash. 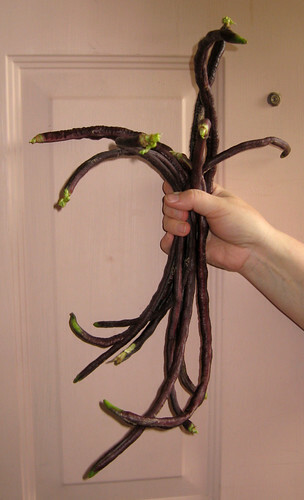 Next, I went to the community garden, where I harvested some beautiful purple-podded yard long beans. After that, it was home and a quiet evening. But the next day I started all over again, first making potato salad with loads of dill from my backyard — it was fantastic. Then I made zucchini muffins — again fantastic — and then I got tired. For dinner we just had potato salad, zucchini muffins and stir-fried long beans. The beans are so cool. They turn black when cooked, and taste a bit nutty.